A lot has happened since the last article about Bandit. So I figured I could fill you in on his progress to date. To start, I must fill you in on a little backstory of us meeting some really great people, the Clemens family from Idaho. 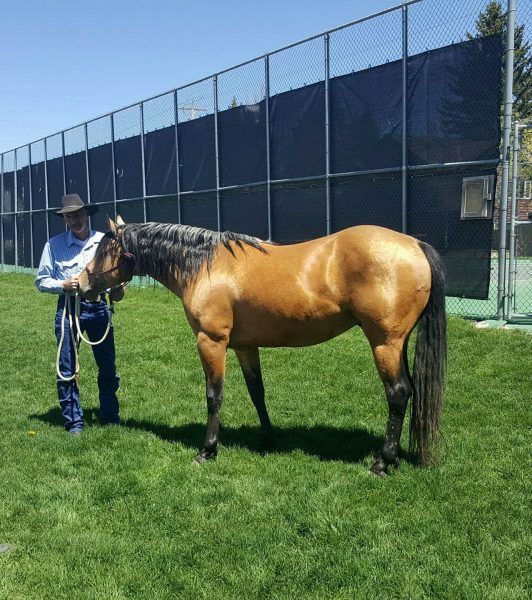 We had another buckskin stallion named Hollywoods Lil Champ and he was as cool as they come. My dad raised him. My husband and I started him. We offered him for sale online and within just a few hours the Clemens family contacted us and said they would like to purchase him. For the exchange we met half way in Jackson Hole, WY. When we met them we instantly felt at ease and could tell Hollywoods Lil Champ was in good hands and going to a great new home. Which for anyone who has ever sold a horse that they loved, knows is so important. Since then we have kept up through Facebook and we have seen that Kiley Clemens has taken Hollywoods Lil Champ and done an amazing job with him! 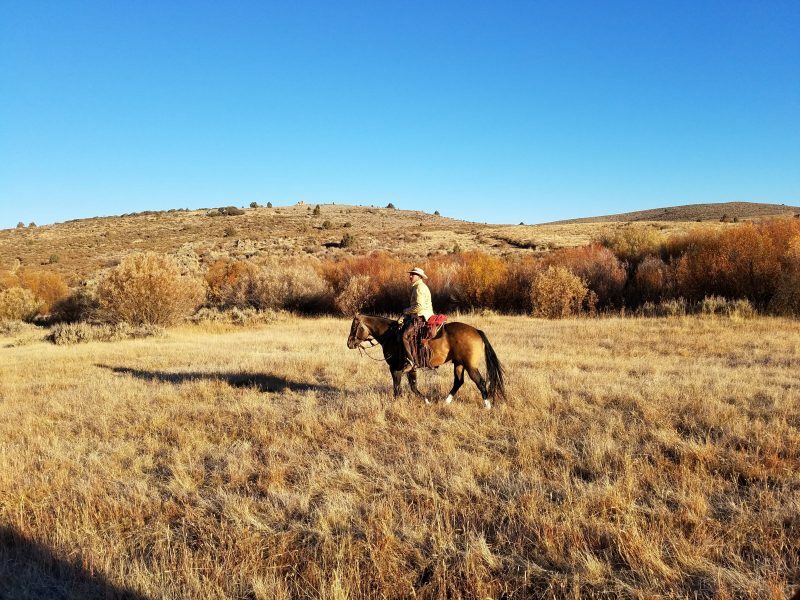 Kiley lives and works on a ranch that spring and fall calves so there is horseback work to be done year round. Kiley took Hollywoods Lil Champ, who he calls Hollywood, and put him straight to work. 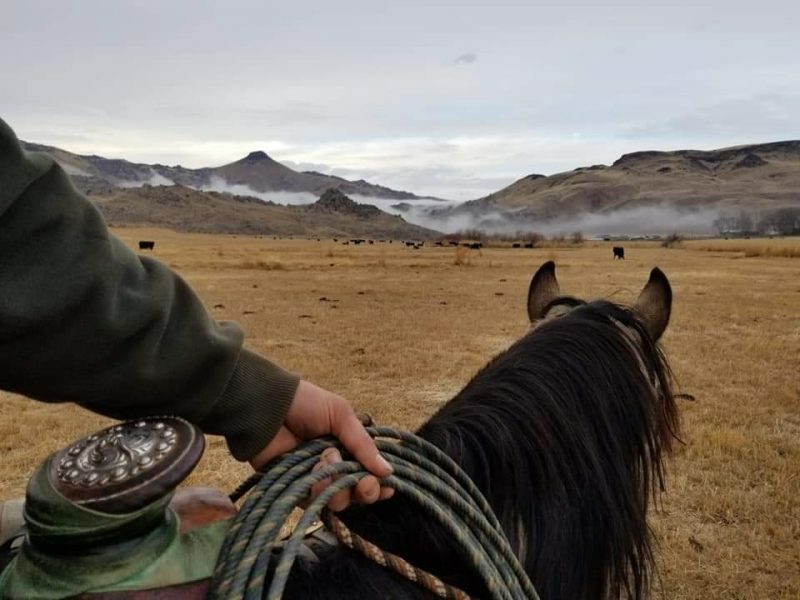 The first week he had him, he was moving cows on the mountain in the rain. 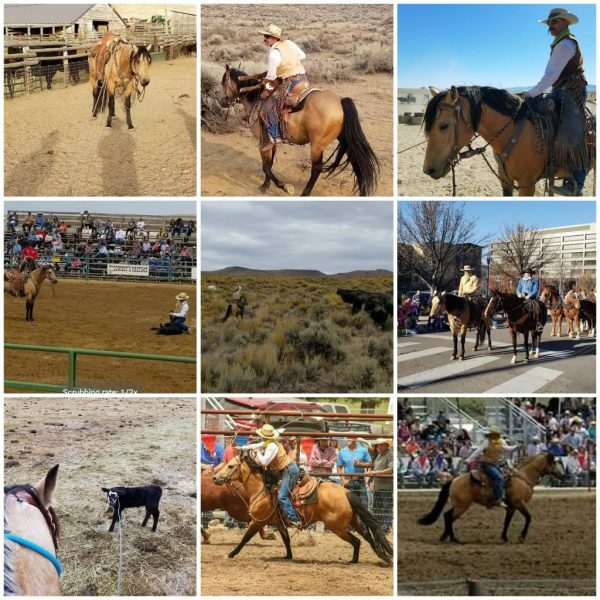 The following weeks and months filled with roping, tagging, and even carrying calves, proved that Hollywood has a lot of jobs to do and Kiley is doing a fantastic job with him. He has taken him to the Jordan Valley Big Loop. Kiley and his stud did great in the Dally Calf Roping at the Bruneau, ID Rodeo! Kiley and Hollywood have also graced a few parades just for fun. It is fun to jump on Facebook and see the adventures of Kiley and Hollywood. They are always up to something fun. I am always taking screenshots of what Kiley and Hollywood are up to and sending to my dad for him to see as he is a “non-liner.” One day, my dad messaged me back and said that maybe I should think about sending my stud horse, Bandit, to Kiley as Kiley has a lot more horseback work than I do during the winter and Kiley has been doing such a great job with Hollywood. To be honest, my initial feeling was a hard hit to my pride, but I quickly humbled myself and realized I needed to do what is best for Bandit and not worry about my pride. 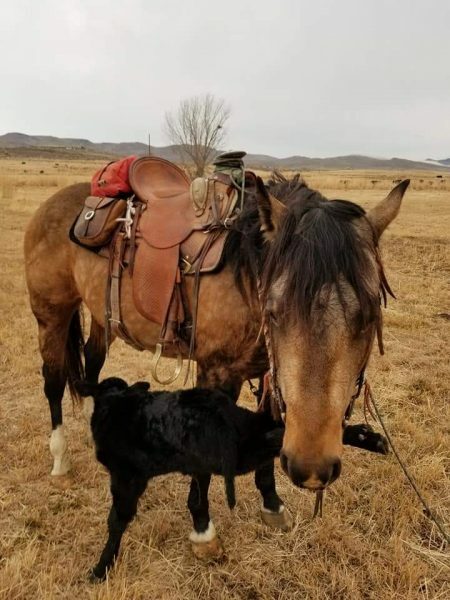 So I contacted Kiley to see if he would be interested in riding Bandit for several months and make a trade for the riding with my weanling roan colt… luckily, HE WAS! Instead of meeting in the middle like we had done with Hollywood, we made a plan to take Bandit all the way to Kiley in western Idaho. This way we could see his country and for the return, Kiley will be bringing Bandit all the way back to Wyoming this summer to come see our neck of the woods. It has been so fun to open up Facebook and see daily goings on of Kiley and Bandit. It truly makes my heart happy that he is doing so well! Bandit is getting the job done and looking good doing it! To say I’m excited to get my stud back is an understatement! I have some fun plans for us! A few days ago, while visiting with Kiley on the phone, he told me a few stories about Bandit and their adventures together. Kiley said that Bandit will drag anything on the end of his rope to where ever Kiley wants to go. Proving so with an escape heifer that kept jumping fence and Kiley had enough of it, so he saddled up Bandit, went out and roped the heifer and drug her all the way back to the barn! 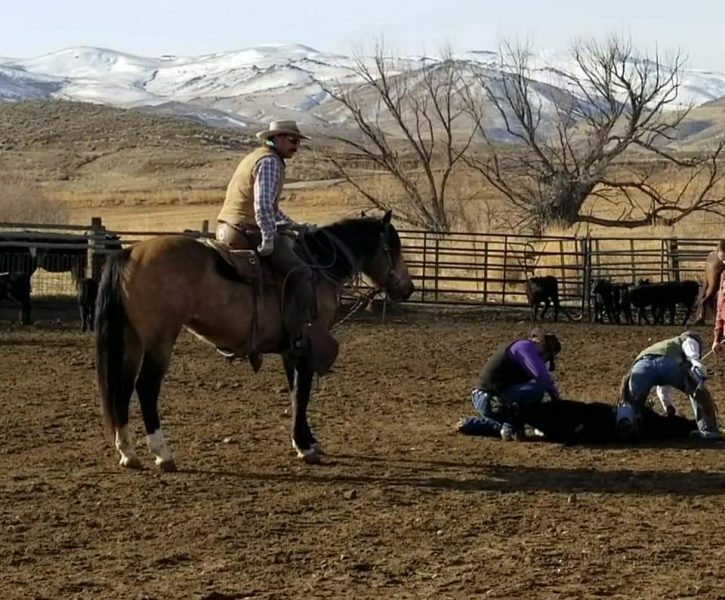 Another day he roped a calf to tag it and the calf ran back up his rope, under Bandit and out through his front legs. 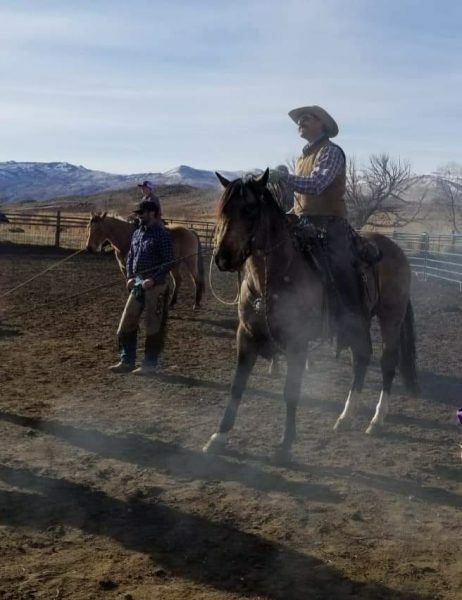 With the rope going through his front legs, Kiley said he was prepared for a wreck, but Bandit didn’t do anything but stand there and hold rope like a mature gentleman. Kiley said he has doctored bulls with foot rot, tagged a ton a calves, and now taken him to work at brandings. I told Kiley how thankful I am that he is doing such a great job with him and he said, “Well, it’s easy, when you send me such nice horses.” Such a simple statement but it really means so much to me. Kiley also said, “I wish I had a million studs as smart, good looking, and respectful as the two I have been fortunate enough to ride from North Four Mile Creek Horse Ranch. Thanks for the opportunity Tiffany.” This quote made my eyes leak a little. It is just so nice to hear these words when generations of my family have put their heart and soul into our horse program. Whenever I hear the Dave Stamey Song, Buckskin Horse, it definitely gives me all the feels! I am so excited to get Bandit back this summer and go on with him. Bandit is getting the outside miles and jobs to build his confidence that he needs. After all we have been through together in his life to date, it is such a relief to know he is on track for reaching his potential and he is getting the ranch work foundation that I believe is so important for him to be the versatile horse I know he can be!